↑ Caso, A., Lopez-Gonzalez, C., Payan, E., Eizirik, E., de Oliveira, T., Leite-Pitman, R., Kelly, M., Valderrama, C. (2008). 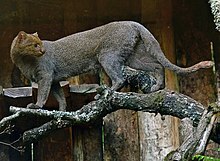 "Puma yagouaroundi". IUCN Red List of Threatened Species. Version 2011.2. International Union for Conservation of Nature. หน้านี้แก้ไขล่าสุดเมื่อวันที่ 20 มกราคม 2562 เวลา 12:21 น.